A composite of the Pipe Organ and Hallgrímskirkja (church of Hallgrímur) in Reykjavik and Skógafoss waterfall in the south of Iceland at the cliffs of the former coastline. Harpa's façade consists of a steel framework clad with geometric shaped glass panels that creates a vibrant display of light, shadow and colour. The Krýsuvík geothermal fields, where the hot springs have formed, the soil is colored in bright hues. A composite of a 360VR of the Dome Reading Room at the State Library of Victoria, taken by Brian Richards, and a mashup of 'ULTRA VIBRANDT' projections by Judy Brandt, Visual Artist and Designer from Melbourne. 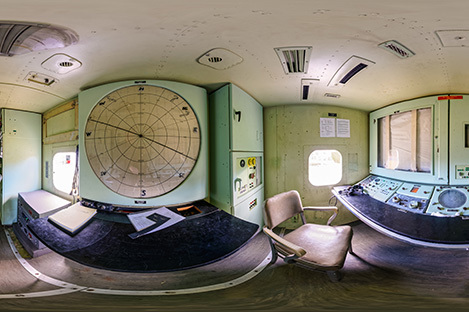 With the beginning of the Cold War, Fort Hancock became home to NY-56 that included a missle launch area and an Integrated Fire Control (IFC) site, shown here, that has been closed and abandoned since 1975.